Woollyhugs > Latest.. > Latest > 2017 – A Woolly Year in Review. 2017 – A Woolly Year in Review. We always worry, we wouldn’t be us if we didn’t, and we ask such a lot, but folk never fail to amaze in response, we reach for those stars together. Our ongoing projects are ambitious and stronger than ever thanks to you. We knew her time left with us was short, but the news of Candy’s (Zombie’s) death back in January 2017 was still a sad shock, she will be much missed by all who love her. Just before, Zombie donated funds to Woolly Hugs and together we hatched a plan to develop an ongoing project with her, which she loved, to make comforting cosy blankets with love in every stitch for women going through treatment for breast and other cancers, and at times these may form part of palliative care. So glad we could establish Candy’s Hugs with her and thanks to you wonderful people achieve her ambition of seeing it all well underway before her death. Since then this year over 50 Candy’s Hugs have gone to wonderful women on the rocky road of cancer treatment. what a wonderful legacy Candy’s Hugs is, one of love and strength, of friendship, learning and developing crafting skills, of creativity, of coming together to show compassion, support and give and receive comfort. Such a beautiful inspirational woman. How lucky we were to know her. Chernobyl 2017 proved to be quite extraordinary! Our initial aim for 70 blankets for our Children of Chernobyl project was blown out of the water as with your incredible enthusiastic love and support we were able to help many more children than we first hoped, gifting a blanket to 120 children (fondly know as our Chernobs!) visiting the UK in the end last summer, that is the equivalent of 9600 six inch squares!!!! Wow, thank you doesn’t come close! And all hail the incredible Construction Crew who have really come into their own in 2017, for this and several other projects, we could not function without you, the sheer joyful enthusiasm our calls for help is met with makes us so teary and thankful, what wonders you are. Thank you! We all love seeing photos of the children wrapped in love and cosy comfort which continues as they go home to Belarus. We were privileged to meet the children visiting Portsmouth and Gloucester, very precious days indeed. And all those extras folk sent and ice cream funds too, it all makes a real difference to the lives of these children, what amazing empathy and generosity, thank you. It all officially starts again soon, 2018 may even be bigger, we are already collecting Hugs for Heads to go with the blankets next summer! Thanks to you too, all of our ongoing projects are stronger than ever. From here in the UK to as far away as Kurdistan, Syria, Malawi, Cameroon, Belarus and Ghana children and their families are feeling love, warmth, support and comfort through our Refugee Project, Billie’s Blankets, Little Hugs, Kinship Hugs and Christmas Hugs for children living in the Chernobyl contaminate zone. Thinking too of all the families who have received our Angel Hugs and Teds in incredibly bleak and devastating times. Love in every stitch we say and it really is true. Our Angel Hug project with the Brompton Hospital in London came to a finish this year, we now work with Glasgow Maternity hospitals. We estimate over 2000 items have been sent this year as part of our Refugee project, truly love in every stitch for those who receive them. It was wonderful too to help Debbie Bliss take warm hats and scarves over to France, and provide comfort to families arriving in the UK in December. Over 300 blankets have been sent as part of our Refugee project this year alone, with about a third made using separate squares folk send, everyone contributing what they can (huge thanks here to our wonderful Construction Crew!) scarves, jumpers, cardis, mittens, bootees, the quantity is truly humbling. So much love and woolly warmth going to folk who really need support, our thoughts are with all the families. Events in Manchester on May 22nd shocked everyone to the core, our Hugs for Manchester project began as an urgent appeal in the aftermath of the bombing at the Ariane Grande concert. The Woolly Hugs crew responded amazingly to the rallying cry. 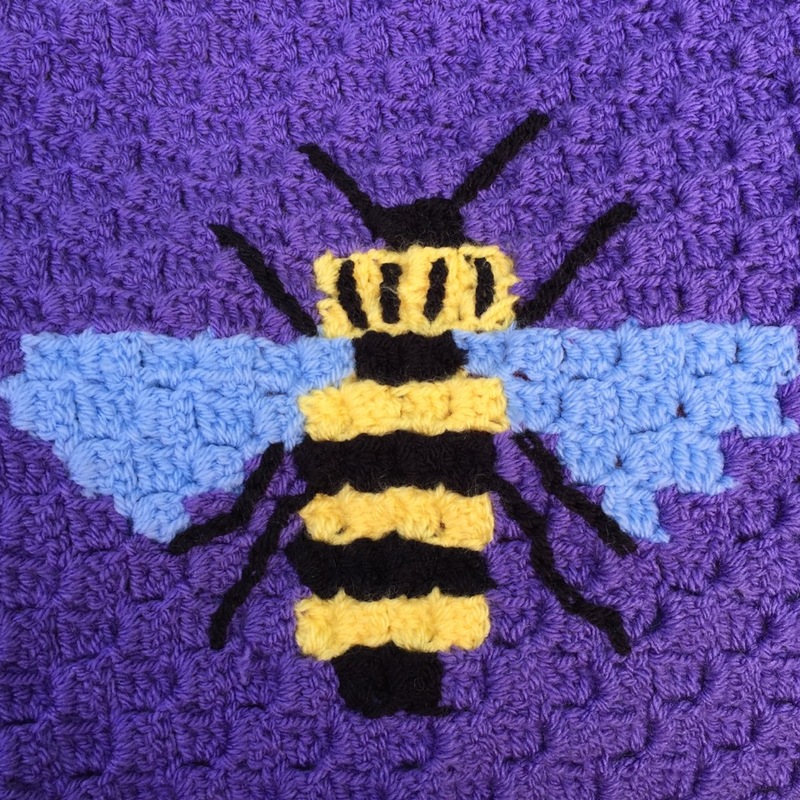 We had to do something and after speaking with the Royal Manchester Children’s Hospital about sending Little Hug blankets to children and families there, which they have said they would love, we decided to make and send joint Little Hug blankets. These were also to be offered where any of the Woolly Hugs crew personally knew families affected by the bombing. So far we have sent five of these family blankets, and two very large collections to RMCH. Thank you so much everyone again, this is now an ongoing project and has become a regular part of our Little Hug project. We’ve made woolly knockers again this year! Always a popular project, to help community nurses who are on the hunt for more of these valuable props to enhance their breastfeeding support sessions. With so many babies born every year, they really do get through a lot! Breastfeeding is not always easy, and the woolly knockers are fabulous to help with latching, feeding, positioning and expressing demonstrations, and are such a useful tool for both new mums and staff. Thank you so much for taking part, we do love to help. We were very glad to be able to help with a very special project to help support bereaved families at a London children’s hospice. We have been approached by lovely MrsDV who works here asking if we can make special blankets for the bed in their Butterfly Suite (post bereavement room) so these will be used to to dress the bed with. We are so glad she did. At an intensely bleak and dark time there is still something very positive and personal that together we can do for the child and their family. We made four blankets, delivered just before Christmas. Love in every stitch. Always. And it didn’t stop there, together we very recently raised £2250 for Meningitis Now through our Christmas Craft Sale, with over £1000 going to support our ongoing projects, and earlier in the year £2285.21 at our Spring Sale, thank you so much to everyone who helped in any way! This last week we had to submit our first Annual review for the Charity commission, and one of the questions was about the number of volunteers we have on board. Impossible to say really, but several thousand for sure. Woolly Hugs wouldn’t exist without, we are so grateful to everyone on board. We all do what we can do, we all fit in this in around families, busy lives, work commitments, a hundred and one other things, which truly makes it all so amazing. No one can do this alone. We just do our best, tis all we have. And if you are reading this thinking you’d like to jump in, PLEASE make 2018 the year you do, we’d love to have you with us, message us if you you’d like a chat about how. Our aim is always to be inclusive, no one should be excluded because they can’t afford to join in and we welcome al levels of ability, from someone keen to begin to learn to someone with a lot of experience. Where will 2018 take us? We’d best be ready!